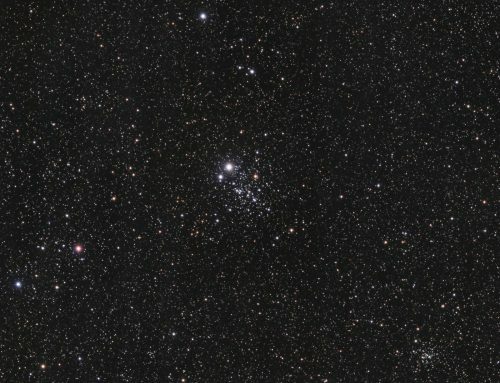 Auriga is one of my favourite constellations to roam with binoculars, especially during the winter. It contains several splashy open clusters, including M36 (shown here), lies more or less in between M37 and M38. All three are easy to find quickly when it’s cold out, and very pretty to look at. 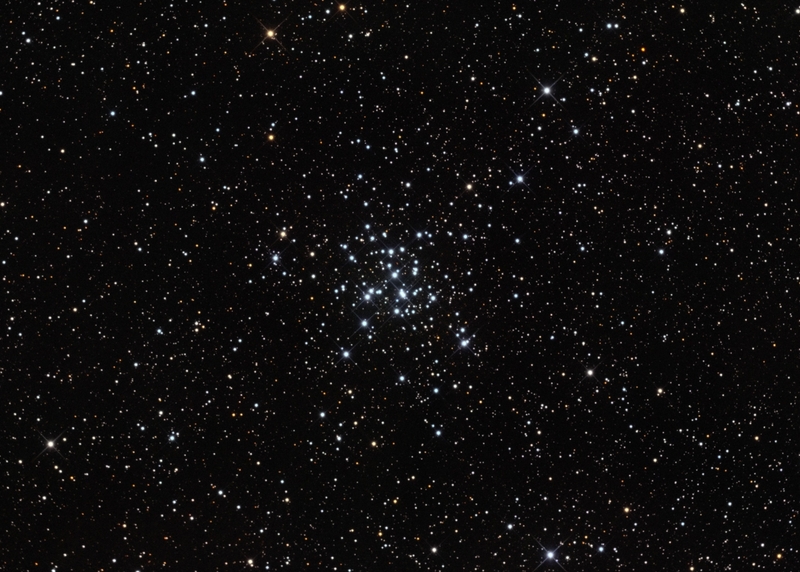 M36 is about 4,100 light years away and contains at least 60 members. It is about 14 light years across. 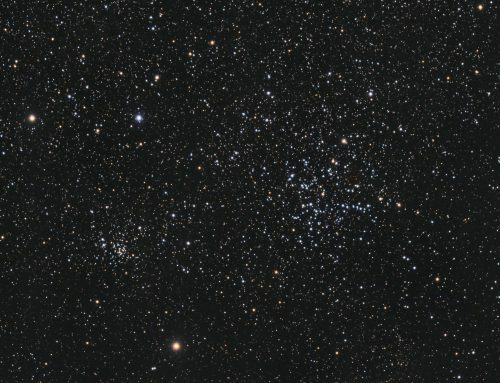 Although it is farther from us, M36 is similar in size to The Pleiades (M45). 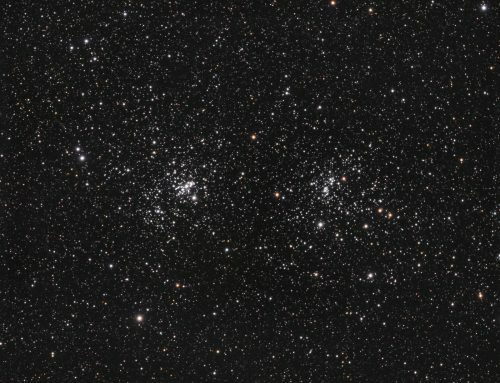 The two clusters might look similar if they were at the same distance from us. 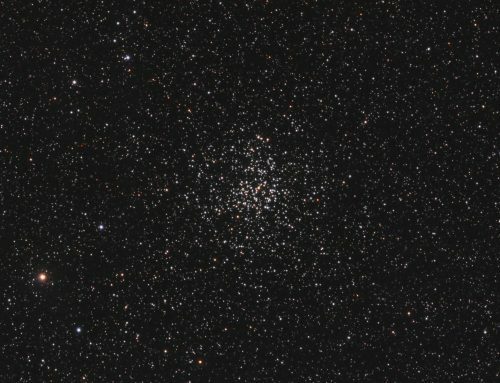 SBIG STL-11000M camera, Baader RGB filters, 10″ f/6.8 ASA astrograph, Paramount MX. Guided with STL-11000’s external guider and 80 mm f/6 Stellar-Vue refractor. Acquistion and guiding done using Maxim-DL. Focusing with FocusMax. Calibration, registration, integration and all processing in PixInsight. Shot from my SkyShed in Guelph, Ontario. Crescent moon and average to poor transparency and seeing. 15x5m R, 12x5m G and 12x5m B unbinned frames (total=3hr15m). 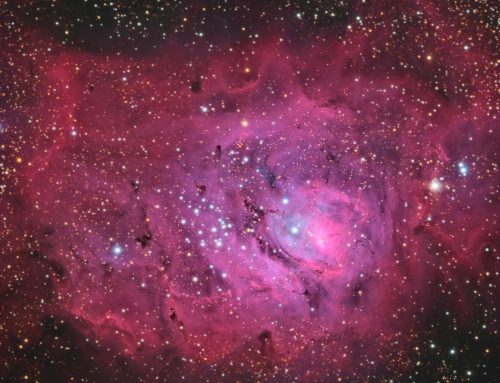 R, G and B masters were cropped and combined to make an RGB image which was processed with DBE and ColourCalibration. HistogramTransformation was applied. Creation and cleanup: The cropped R,G and B masters were combined using the ImageIntegration tool (average, additive with scaling, noise evaluation, iterative K-sigma / biweight midvariance, no pixel rejection). DBE was applied to neutralize the background. TGVDenoise was applied to the L only, followed by CurvesTransformation to darken the background. A copy of the image was made and LinearMultiscaleTransform was applied to extract the first 4 wavelet layers (no residual). This image was used as a mask to protect the background while ColourSaturation was applied to the star cores.